I have been having some dental work done over the past couple of weeks, which inflamed my temporomandibular joint (because of having to hold my mouth wide open for 2.5 hours total.) I was forced to temporarily stop eating all the foods I normally love - chewy kale salads, brown rice, red cabbage and other raw vegetables, blue corn tortilla chips, and the like. I searched online for ideas of soft foods to eat when you have major dental work done, and didn't find much beyond mashed potatoes, pudding, and ice cream. Mashed potatoes are awesome, but not for every meal, and since I don't eat sugar any more, if I'm going to have pudding or ice cream, I've got to make it myself with an alternative natural sweetener or fruit. So I had to really brainstorm and search my cookbooks to come up with some decent-tasting foods to eat that were basically liquid or pureed. Either that or continue to be in fairly unsettling pain 24/7. I chose the former, because I really hate pain. 1. First breakfast: fresh juiced veggies. I do this 99% of my mornings anyway, but if you're on pureé only, it's an excellent way to make sure you're getting enough nutrition from raw vegetables. My absolute FAVE veggie juice at the moment: 4-5 medium carrots, 1/4 of a beet, a 1.5-inch piece of ginger root, and 1 cup of coarsely chopped parsley. The carrots and beet are deliciously sweet, the parsley tones down the sweetness with a delicious green flavor, and the ginger gives it a throat-burning kick that I love. 2. Second breakfast: Bob Mills' Creamy Wheat Farina hot cereal. I normally eat Bob Mills' Brown Rice Farina in the morning (kind of addicted to it, actually) because it's filling, yummy, and gluten-free, but under drastic circumstances I resorted to trying his Creamy Wheat Farina because it's even softer, not chewy at all. It's really delicious with a few twists of Himalayan Pink Salt, a heaping teaspoon or so of Coconut butter melted in, and a generous amount of cinnamon sprinkled over the top. 3. Lunch: Giving up my normal lunch (quinoa-raw veggie salad tossed with lemon juice and flaxseed oil with a couple twists sea salt and black pepper) for the past several days has been hard. Mostly I took small portions of leftovers to work from the pureed soups I've been making for dinner. Best lunch so far was gazpacho, which I'm not normally a huge fan of, but it tasted pretty good this past week when my choices were so limited. The recipe I used is in an old cookbook I own, but you can search gazpacho online until you see a recipe that sounds good to you. 4. Afternoon/After work snack: Green smoothie. This is also a part of my normal daily routine anyway, but it has been especially delicious and important for nutrition this past week since I had to stay on purees only. - Basic potato soup (onions sauteed in olive oil, veggie broth, small diced potato, salt, cooked until very soft and then pureed with an immersion blender until only about 1/4 of the potato chunks remained.) Easy and deliciously satisfying. 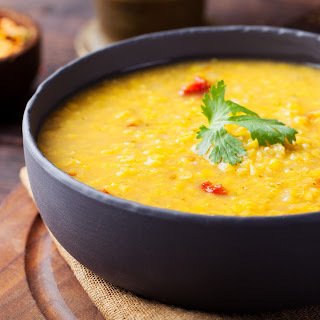 - Indian Dal, pureed. The recipe I used this past week is from this cookbook by Ruta Kahate, but you can make any Dal you like and just puree it in a blender or food processor. - Mashed sweet potatoes. Just boiled then mashed with a little olive oil and salt. - Roasted Cauliflower Soup with Cumin. Another soup that calls for pureeing. The recipe calls for milk but it's perfectly delicious without it. - Guacamole. Yes, just a bowl of guacamole, no chips. When you're desperate for flavor, it tastes really good. - Hummus. Again, just a small bowl of hummus, no pita or carrot sticks. I can only eat a little of it this way because it's rich, but yum. Tonight I'm making vegan baba ganoush and planning to have it with my leftover cauliflower soup and a little hummus. The eggplant for the baba ganoush is roasting in my toaster oven right now. 6. Sweets/Desserts. This one I'm still working on, and it's been difficult because of my no-sugar rule. I made a sugar-free version of this Chocolate Avocado Mousse with carob instead of chocolate that lasted me a few nights, and I've eaten a few organic unsweetened applesauce cups for dessert. Today I made this vegan cheesecake recipe by Minimalist Baker with dates instead of maple syrup, minus the crust. It's setting up in the freezer right now so here's hoping it's good later tonight. I'll be on puree and liquids for another week or so, hoping my TMJ thing is completely healed up in time for my Spring Break trip to Huntington Beach. That area is Vegan Paradise and I really, really want to be able to eat at Seabirds and Au Lac while I'm there. Hope this post helps someone with TMJ and/or dental pain who's looking for good healthy foods to eat while they heal! 8/4/16 - update to this post. So Delicious makes a vegan, sugar-free ice cream that is sweetened with monk fruit and is absolutely wonderful. It's really expensive, but it's been a life-saver to satisfy my sweet tooth without chewing this summer. Thank you for the wonderful ideas for nutritious soft food. Especially helpful for people with TMJ. I believe that eating healthy helps the healing process, however, most soft food is comfort food, full of starch and sugar. Have you tried split pea soup yet? I takes a long time to get the peas soft, but it's well worth the wait. Hi Cynthia! Yes, I noticed that too, that most people's go-to soft foods (ice cream, anyone?) don't fit my diet rules. I LOVE split pea soup and yes, I have made it with extra-soft peas (I don't think I soaked them--I think I just cooked them down until they were mush. Soaking would probably be better for digestion though.) Are you struggling with TMJ as well? Man, it seems like it takes forever to get those muscles and the joint itself un-sore again. Just in the past couple of weeks, I am finally seeing some progress.